Anybody who has experienced jet lag knows the power of the biological clock. Almost all organisms, from humans to the smallest of bacteria, have a built-in system that tells them whether it is time to rest or to be active. 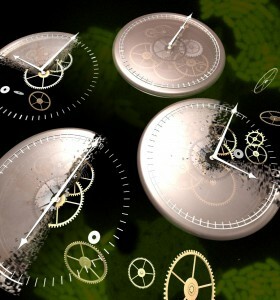 Most biological clocks ‘tick’ autonomously, but some bacteria depend on light to synchronize their clock every day. Using mathematical calculations, researchers from AMOLF and the University of Michigan have now demonstrated that an autonomous clock suffers far less from noise, such as fluctuations in sunlight due to clouds. The research results were published online on August 14th 2018 in the scientific journal Physical Review Letters. Virtually all organisms have a day-night rhythm, because of which they eat and sleep at fixed moments of the day, for example. This rhythm is dictated by the protein concentrations in the organism’s cells that continuously vary (oscillate) over a period of 24 hours: the circadian clock (from the Latin words circa -about- and dies -day).